Trimble’s revolutionary ACU controller incorporates a sophisticated graphical display and Bluetooth™ technology. The result is a cable-free or on-board data collection solution that gives you even more flexibility than ever before. The ACU is specifically designed to attach to Trimble field sensors—it simply clips on to your total stations, your robotic rovers, or your RTK GPS rover poles—whatever you are working with. The ACU provides a single user interface to the most advanced on-board applications available. The easy-to-use, color touch-screen display provides you with ultimate control over your data. Instant results make light work of visualization, navigation, data selection, positioning, and stakeout. Errors and omissions are greatly reduced because you can thoroughly check your data in the field. Built-in Bluetooth capability gives you a short-range cable-free solution at the pole—set up is quicker and cable hassles become a thing of the past. 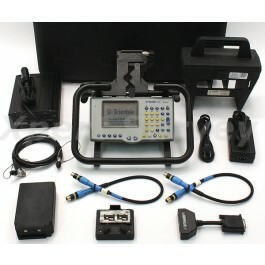 The ACU controller provides a common user interface for all your fieldwork regardless of the type of measurement technique or sensor used. The Trimble ACU is attachable to the “hot shoe” on the Trimble 5600 or 3600 Total Stations, Trimble 5600 robotic rover, and the Trimble 5800 RTK Rover pole. USB, serial, and ethernet communications are provided as standard, giving you fast and flexible data transfer options. In addition, the ACU is Internet-capable, with an external wireless modem you can easily send and receive files while you’re in the field. The Trimble ACU offers you a choice of software: Trimble Survey Pro software from TDS**, and Trimble Survey Controller™ software. In addition, the Windows CE operating system supports other specialized application software. Trimble ACU is powered by the instrument, or the robotic/RTK rod holder. The internal battery provides one hour of stand-by operation when detached from the instrument or rover. Environmentally rated to IPX4, and able to withstand a drop of up to 1 meter (3.3 feet) onto a hard surface, the ACU is rugged enough for any job. In addition the heated screen system allows for operation at extreme temperatures from –20° C (–4° F) to +55° C (122° F). Dedicated instrument control keys provide rapid access to frequently used functions and minimize keystrokes during data, code, or attribute entry. Both the color display and keyboard are illuminated so that you can keep working in low-light conditions. In full sunlight or total darkness the ACU is an all weather, all visibility controller for any time of the day or night. Connects to external power supply through any of its ports to charge the internal battery pack. Environmental: Meets appropriate IEC 68, EN61000, MIL-STD-810E standards for temperature, moisture and immersion, dust and sand, drop test, shock, vibration and altitude. Shock and vibration: Withstands shocks and vibrations according to IEC, EN6100, and MIL-STD specifications. Certification: Class B Part 15 FCC certification, CE Mark approval and C-tick approval. Keyboard: 36-key tactile action, with navigation and dedicated instrument control keys. Full alphanumeric keyboard. Audio: Integrated speaker and microphone, external capability through Multiport.